133 Marlborough is located on the north side of Marlborough, between Clarendon and Dartmouth, with 131 Marlborough to the east and 135 Marlborough to the west. 133 Marlborough was designed by Peabody and Stearns, architects, and built in 1879-1880 by Weston & Shepard, builders, for Charles William Freeland, one of seven contiguous houses (121-123-125-127-129-131-133 Marlborough) built for him between 1877 and 1880, all in the same design and built for speculative sale. The original permit application for 133 Marlborough was dated April 12, 1880. Click here for an index to the deeds for 133 Marlborough. On June 23, 1881, 133 Marlborough was purchased from Charles Freeland by Arthur Amory. He and his wife, Elizabeth Wilcocks (Ingersoll) Amory, made it their home. They previously had lived in the Longwood district of Brookline. Arthur Amory was a dry goods merchant in Boston. He also was president of the Indian Head Mills in Alabama and an investor in several New England mills. Elizabeth Amory died in March of 1905. Arthur Amory continued to live at 133 Marlborough with their unmarried son and daughter, Ingersoll Amory, a cotton broker, and Ethel Amory. On July 5, 1906, Arthur Amory transferred 133 Marlborough to Ingersoll Amory as trustee on his behalf. Arthur Amory died in August of 1911. Ingersoll Amory and Ethel Amory continued to live at 133 Marlborough during the 1911-1912 winter season, but moved soon thereafter to an apartment at 199 Marlborough. On September 11/13, 1912, 131 Marlborough was acquired from the Amory family by Flora (Grant) Gray, the wife of Morris Gray. They previously lived in Chestnut Hill, where they continued to maintain a residence. It was about this time that an additional story was added to 133 Marlborough. The house appears as four stories plus basement on the 1908 Bromley map, and as 5 stories plus basement on the 1912 map. Morris Gray was an attorney and trustee of estates, and served as President of the Museum of Fine Arts. Flora Gray died in September of 1920. Morris Gray continued to live at 133 Marlborough and in Chestnut Hill until his death in January of 1931. 133 Marlborough was not listed in the 1932-1937 Blue Books and was shown as vacant in the 1934 and 1935 City Directories. On May 10, 1935, 133 Marlborough was acquired from Morris Gray’s estate by Mary C. McGill of Somerville. On October 22, 1935, it was acquired from Mary McGill by Miss Dorothy (Doris) Hunton Durkee, a telephone company employee. She lived in Brookline with her widowed father, Frederick McLellan Durkee. In February of 1936, she applied for (and subsequently received) permission to convert the property from a single-family dwelling into a lodging house. 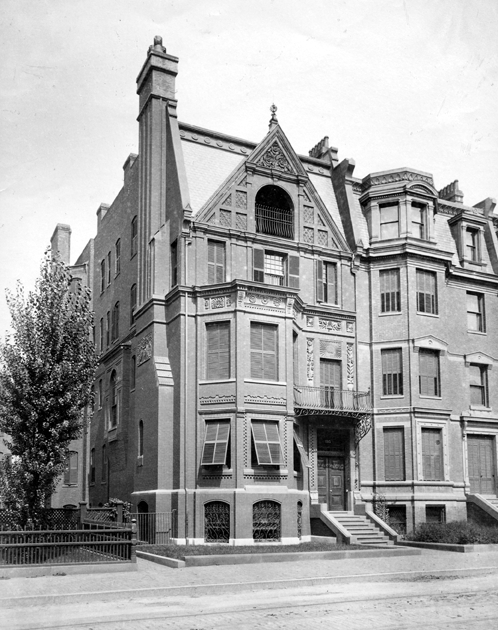 133 Marlborough became the home of Mrs. Bonnie E. (Stitt) Hunton, who operated the lodging house. She was Dorothy Durkee’s step-grandmother (Dorothy Durkee’s deceased mother, Carolyn Snow (Hunton) Durkee, was the daughter of Frederick Wood Hunton; Bonnie E. (Stitt) Hunton was Frederick Wood Hunton’s second wife and widow). Bonnie Hunton previously had lived in Brookline, where she had operated a lodging house. Dorothy Durkee married in 1942 to George Harding Fobes. On July 11, 1946, 133 Marlborough was acquired from Dorothy Fobes by Benjamin George Brooker, a certified public accountant and real estate dealer. He lived in Newton. Bonnie Hunton continued to live (and operate a lodging house) at 133 Marlborough until her death in May of 1947. In January of 1947, Benjamin Brooker filed for (and subsequently received) permission to convert the property from a lodging house into thirteen apartments. 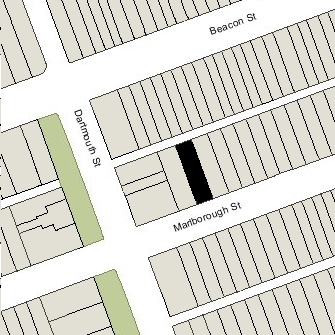 He also owned 135 Marlborough, and in October of 1948, he applied for (and received) permission to cut through doors between the two buildings. 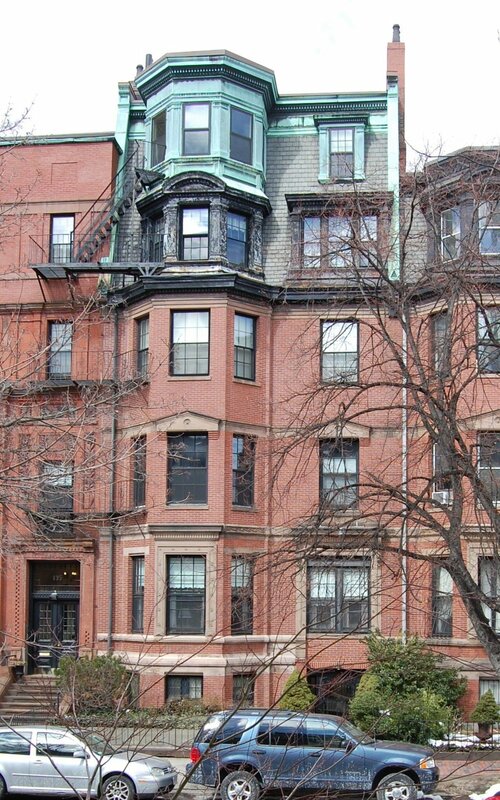 After the remodeling, Benjamin Brooker moved to one of the apartments at 133 Marlborough. He married in about 1949 to Hannah (Botzin) Myers, the former wife of Harold Myers. 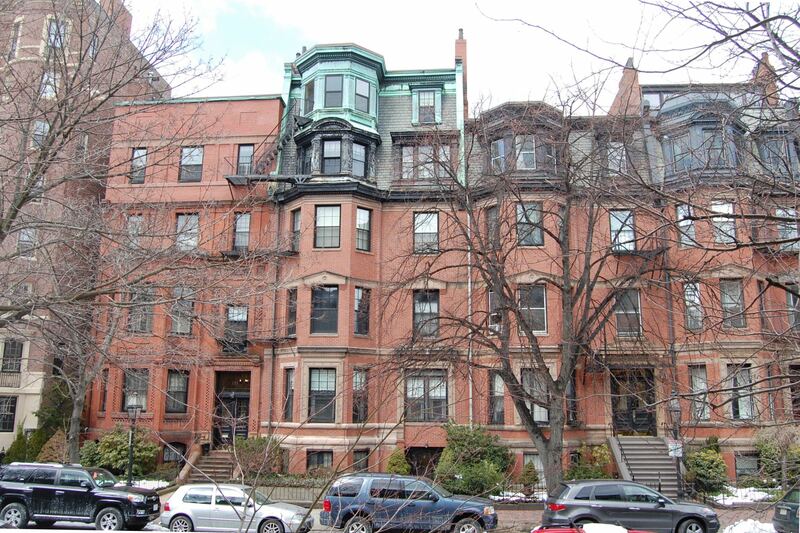 After their marriage they lived at 133 Marlborough until about 1960, when they moved to 101 Beacon, which he had purchased and remodeled.